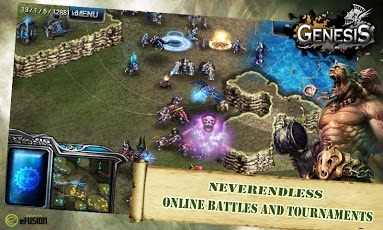 Genesis, the best online RTS for your Android. Premium version does not contain any advertise. In the distant future, in the darkest regions of space, the ghosts of the past silently whisper your name. You are the commander, hero who lead nations to their salvation. The Humans, Demons and Noahs found itself on the brink of extinction and forcing all units to final strike for redemption. Some believe you may have given up the fight. But you have promises to keep and conquer the world of genesis for the rest of all times. You will never be forgotten. 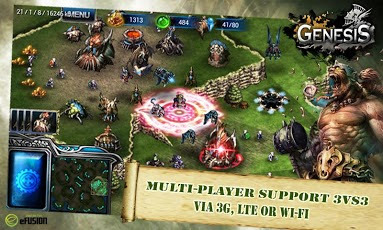 Genesis is a Online RTS developed in South Korea which became very successful and popular among all players in Asian market. Beside story mode single player the game also offering multiplayer option. 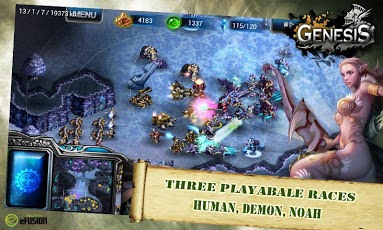 Players can choose from one of the three playable and totally different races – Human, Demon and Noah. 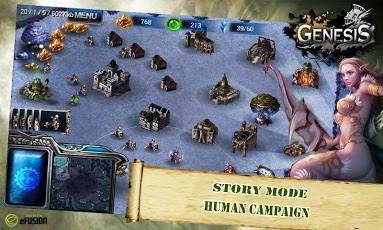 Each race contain unique buildings, units and upgrades and it’s up on the each player if he want to play and fight with mystical dragons and monsters, robots and Hi-tech machines or sci-fi alien units.